(Phys.org) —Exposing packaged liquids, fruits and vegetables to an electrical field for just minutes might eliminate all traces of foodborne pathogens on those foods, according to a Purdue University study. More information: Atmospheric Cold Plasma Inactivation of Escherichia coli in Liquid Media Inside a Sealed Package, D. Ziuzina, S. Patil, P.J. Cullen, K. M. Keener, P Bourke, Journal of Applied Microbiology, 2013. Aims: The main objective of this study was to determine the inactivation efficacy of dielectric barrier discharge atmospheric cold plasma (DBD-ACP) generated inside a sealed package for Escherichia coli ATCC 25922. Methods and Results: A plasma discharge was generated between two circular aluminium electrodes at 40 kV. E. coli suspensions (107 CFU ml−1) in either maximum recovery diluent (MRD) or phosphate buffered saline (PBS) were treated in a 96-well microtitre plate inside a sealed package. The effects of treatment time, post-treatment storage time, either direct or indirect samples exposure to the plasma discharge and suspension media were studied. Regardless of the media tested, 20 s of direct and 45 s of indirect plasma treatment resulted in complete bacterial inactivation (7 log CFU ml−1). At the lower plasma treatment times (10–30 s) investigated, the effects of suspension media and mode of exposure on the inactivation efficacy were evident. The inactivation efficacy was also influenced by the post-treatment storage time. Conclusions: It was demonstrated that the novel DBD-ACP can inactivate high concentrations of E. coli suspended in liquids within sealed packages in seconds. 1) Make blood donations safer? 2) What does this mean to the effects of long term exposure of our bodies and beneficial or symbiotic bacteria, virus and fungi in our bodies to ever-present electrical fields of various strengths and frequencies? BTA - very few people are ever exposed to 40kV electrical fields. Heat treatment kills even those bacteria imbedded deep in the food product. A plasma treatment might only effect surface bugs, which would not be enough considering that once the air in the container reverts back to a normal molecular form, the bacteria deep inside the food might recover and reproduce. What happens in an idealized laboratory conditions is not equal to what is needed in an industrial scale cannery or other packaging or food prep situation. This technology has been around for about 8 years now anyway. Food is cooked based on core temperature because the core must reach the temperature to kill bacteria which are in the interior (they can get there through veins and artieries, or seasoning injections, or other processes. Just running some plasma across the surface of something isn't going to stop internal colonies. Depends on the food being sterilized. If it has intact skin (as in fruits) or has not been ground (steak vs. hamburger), surface treatment might suffice. It would certainly increase the safety of the food over no treatment, especially for vegetables used raw for salads. 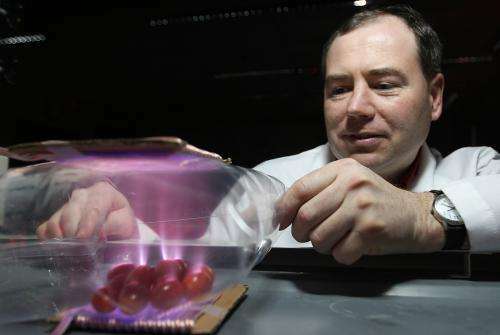 Plasma generates UV light. This must account for at least a portion of what is being observed.